Creating a DIY plant wedding centerpiece is probably one of the easiest centerpieces to make. All you need are the right accessories to make them look stunning on your wedding tables. I really like creating my plant wedding centerpieces in glass vases as it can make them look much more professional. The great thing about using an orchid plant is they come in a variety of colors. They are also an exotic plant, which makes them perfect wedding centerpiece for a tropical or beach wedding theme. 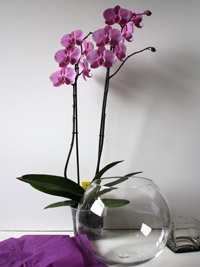 Your chosen plant, in this tutorial I’ve used a cerise pink phalaenopsis plant. A large glass goldfish bowl, mine is 10 inches wide. A small glass cube vase, mine is 3 inches square. Or you could use any similar object. A sheet of coloured paper, mine was a meter square. 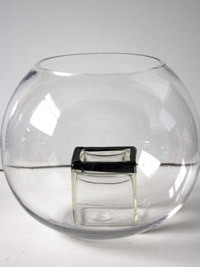 Place the small cube vase into the goldfish bowl, make sure you place it upside down so that the plant can sit on the base of the vase. 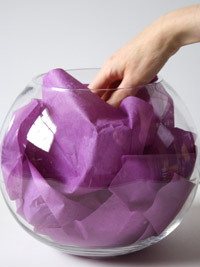 Add the coloured paper so that it covers up the cube vase and sits around the inside of the goldfish bowl. 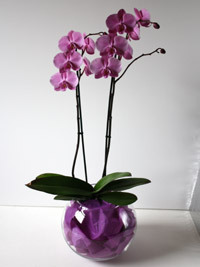 Simply place your orchid plant into the vase resting it on the cube vase. Make sure all of the coloured paper hides the plant pot. The great thing about plant wedding centrepieces is they can be given away at the end of the wedding. Even if you have hired the vases you can still easily remove the plant and the pretty coloured paper to give away as gifts to wedding guests. I would suggest you give this job to a relative or bridesmaid so that they make sure the plants go to a worthy home. It’s often nice to give a gift away to the people that have helped make your day extra special. Another big advantage to plant wedding centrepieces as apposed to fresh flower centrepieces is that they can be made days in advance. Orchids are particularly good for this, as they only need watering every 7 days. So as long as you water them a week before you can make them any time on the week running up to your wedding. I know when I got married the more I could do in advance the better, as you’ll be amazed how many things there are to do on the morning of your wedding.